Garmisch-Classic in Germany is a large resort with 16 lifts that offers skiers an incredible 1350 metres (4429 feet) of vertical descent. Garmisch-Classic has 40 kilometers (25 miles) of pistes. We have no information about the existence of any cross country ski trails at Garmisch-Classic. I was in Garmisch-Classic on 20th February 2011. It happened that at the same day the final of FIS Alpine Ski was held there. However, I did not watch the games, nor did they affect considerably the function of the ski center except from the fact that the lower part of Kandahar run was closed. The distance from Munich is by train (around 90 min). The daily ticket for lifts: 34 euro. Ski rental: 25 euro/day. One needs more than 1 day to ski whole center (maybe 2 days full ski is ok to ski everywhere). I started at Hausberg with easy 7. Then I tried the wonderful 4 (Olympia Abfahrt). 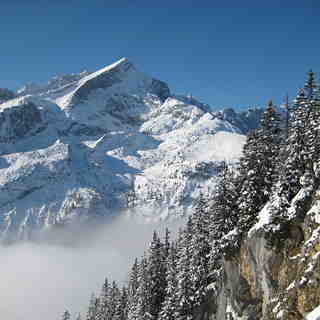 Then I used Kreuzeckbahn and at the top I skied 11 (Hexenkessel) [very nice piste]. Finally through the ski path numbered 13 (and the famous Troegltunell - this is a tunnel with snow in order to keep ski center working during races held in Kandahar) I returned to Hausbegbahn. It has not snowed for 3 weeks. However, the snow was in good condition and only in some places was a bit hard packed. 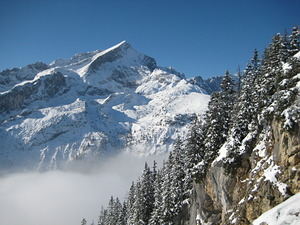 I loved Garmisch-Classic and can't wait to go back there and visit all the pistes that I missed on 20th Feb. 2011. Go there! Very beautiful ski center with fantastic surroundings. Best experience: ski run numbered 4 = Olympia Abfahrt = ski through pine forest! !